This PI meeting included social science, economic, policy, as well as technical perspectives on cybersecurity through plenary talks, breakout sessions, posters, and an adventurous one-on-one researcher “speed dating” experiment. We presented a poster that summarized our current NSF SATC-funded effort to build a platform for online monitoring and analysis of large-scale Internet infrastructure outages. 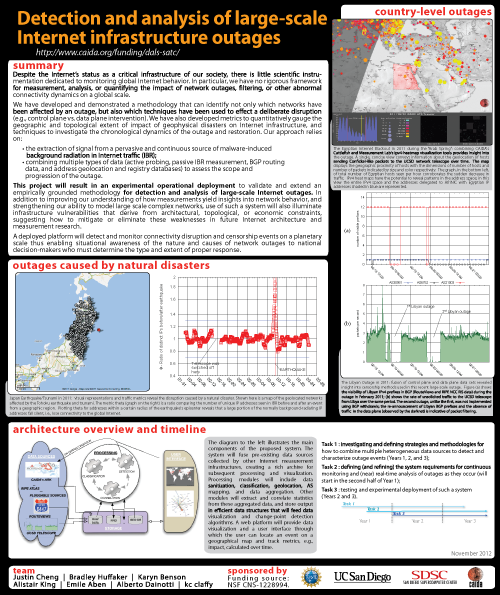 The poster (reproduced below) displays highlights of our previous results from analyzing large outages in Egypt and Libya during the so called “Arab Spring”, and the impact of the earthquakes in Japan and New Zealand in 2011. More soon, as we are still analyzing the most recent large-scale Internet outage in the news (Syria). This entry was posted on Tuesday, December 4th, 2012 at 8:09 pm	and is filed under Commentaries, Measurement, Security, Updates. You can follow any responses to this entry through the RSS 2.0 feed. You can skip to the end and leave a response. Pinging is currently not allowed.